Harlan Ellison is well-known in science fiction circles — in fact, considered a modern master of science fiction, and one of his most critically acclaimed stories came from the "Star Trek: The Original Series" episode "City on the Edge of Forever." Now, fans will get the chance to experience his original, uncut teleplay for the episode, thanks to an adaptation by IDW Publishing. 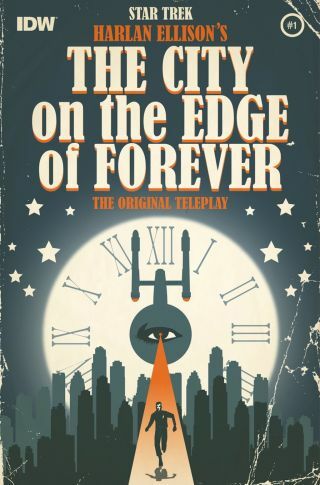 The comic book mini-series "Star Trek: The City on the Edge of Forever" will kick off in June 2014, and is adapted directly from the original teleplay by Ellison, and under his direction, a press release announced. "Star Trek" comic book veterans Scott Tipton and David Tipton will write the adaptation, and J.K. Woodward, who has also done "Star Trek" comics for IDW, will provide fully painted interior art. Juan Ortiz will do covers for the series, coming off his book "Star Trek: The Art of Juan Ortiz" where he made interpretations of every episode of "Star Trek: The Original Series." Ellison, likewise, is excited to see the series come to life. "It was a superlative joy of my long life to have worked with Leonard Nimoy, who became my friend, and many others at 'Star Trek;' and an equally heart-happy joy to be working with J.K. and the Tipton Bros. and Chris Ryall on this long-awaited visual of my (humbly, I say it) brilliant original 'City…'"
"Star Trek: The City on the Edge of Forever" will be five issues, with the first debuting in June 2014. This story was provided by Space.com sister site Newsarama. Follow Newsarama on Twitter @Newsarama and on Facebook. Original article on Newsarama.com.